- the Age of Oil. In 2017, the National Museums Scotland exhibition Age of Oil showcased the work that visual artist Sue Jane Taylor had created in response to the decommissioning of structures in the North Sea. We are delighted to be able to open an adaptation of the exhibition here in Aberdeen, a place so closely connected with the artist's subject. 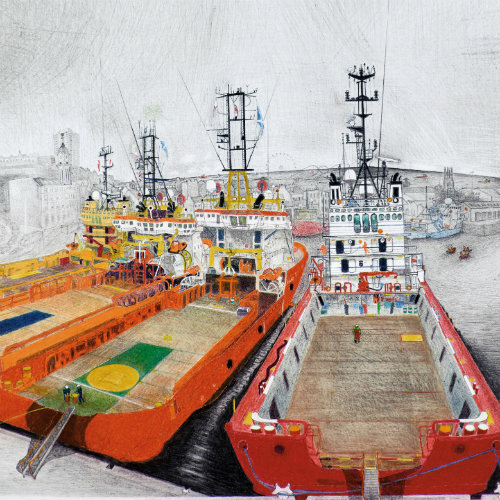 Exploring the people and places of Scotland's offshore energy industry through the eyes of a visual artist, this is a social history document that includes works of art and diary entries. Focusing on four key projects: Aberdeen Harbour, the Murchison Field, the Brent Field and the Beatrice Wind Farm Demonstration Project, the exhibition raises questions between art, environment and industry while revealing an insight into life on board a North Sea platform. This exhibition has been developed in association with National Museums Scotland. Our thanks to the following for the donation and loan of artworks and objects to this exhibition. There will be a series of events to accompany this exhibition. Details will appear here shortly.